I’ve quit and restarted my coffee habit many times over the course of my life. It’s finally time for me to commit to making a lifelong change. I like coffee but the caffeine and even the coffee itself isn’t doing me any favors these days. This post is my written commitment to ditch coffee for good—forever. 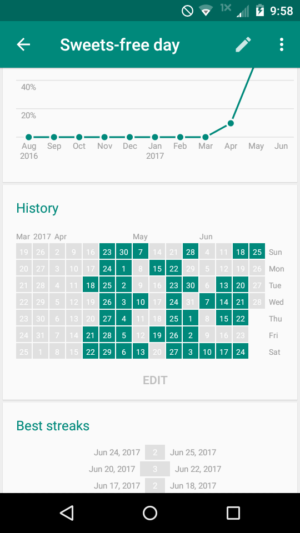 I’ll check in on this once a week or so for a while, then once a month, then only if something changes. As an aside, I’ve also committed to eliminating as many sweets from my diet as I can. I’ve been doing pretty good with that. 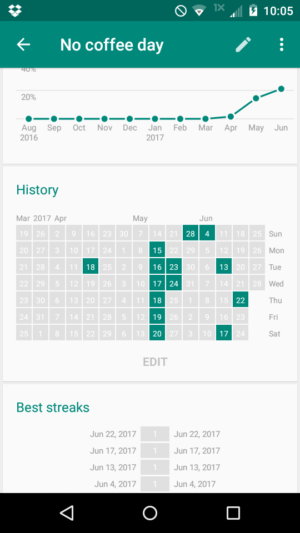 I use the Android app Loop – Habit Tracker to keep up with my success rate, and it seems to help. I’m being pretty strict about what counts, so although I had only a few semi-sweet chocolate chips, they were enough to stop me from marking yesterday and the day before as sweet-free days. I think it’s best that way, because I don’t want half-measures to eventually derail my effort in this.